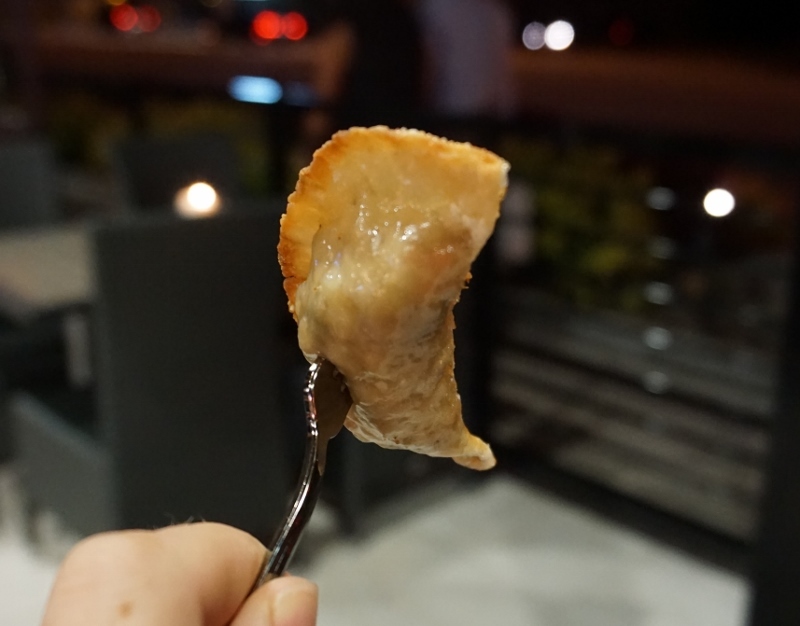 I was invited to come along to Tapa Toro to sample some of their brunch items. They are located on International Drive in I-Drive 360. Tapa Toro's Sunday Brunch happens weekly from 11am - 3pm. Apple Pie Sangria: Made with the Tapa Toro Housemade apple juice syrup spiked with nutmeg, cinnamon and fresh ginger. House Made Focaccia Sandwich: Ham, chorizo, serrano, olive spread, and olive oil. This was one of the tastiest sandwiches I've had in a while! Poached Egg Toast: House alioli on on ciabatta bread with pickled shallots. Tapa Toro Chicken n Pancakes: Fried chicken milanese, fried eggs, and a house honey glaze. Three Little Pigs: Cheese grits, pork belly, chicharrones, and chorizo. Pretty much everything I tried from Tapa Toro's brunch menu was delicious! The flamenco dancing that was also happening in the restaurant was a nice touch as well! 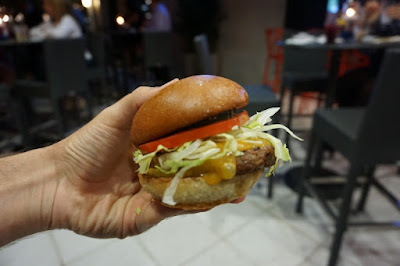 I was invited to visit the Shake Shack on International Drive in Orlando to taste some of their new menu items for the holiday season this year. The visit started out with a sampling of the standard Shake Shake foods including ShackBurgers and Cheese Fries. The first of the holiday menu items was a cup of Brownie-Batter Hot Chocolate. This very thick and rich hot chocolate was topped with whipped cream and chocolate sprinkles. There were three Holiday Shakes to sample. The Chocolate Peppermint shake was my favorite with a strong minty flavor. The Pumpkin Pie shake tasted just like pumpkin pie, and was almost like drinking liquefied pie in a cup. The Christmas Cookie shake was also good, tasting the most like a traditional vanilla shake. These seasonal milkshakes are on the menu until December 31. These aren't new for the holidays, but they were new to me. Shake Shake also sells Shack Burger Dog Biscuits for your pets. I brought a bag of these to a few dogs I know who quickly scarfed them down. 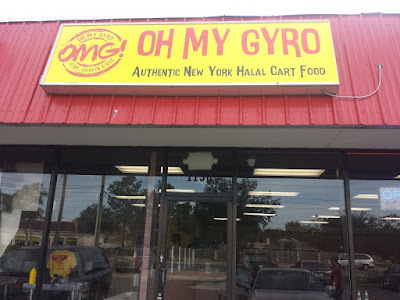 I tried a new restaurant in Longwood called Oh My Gyro. They are in a location that has had an endless cycle of restaurants opening, lasting a few months, and closing again. Because of this, I wish them the best of luck, especially since it seems like they did major renovations on the space since the last time I was in the building. 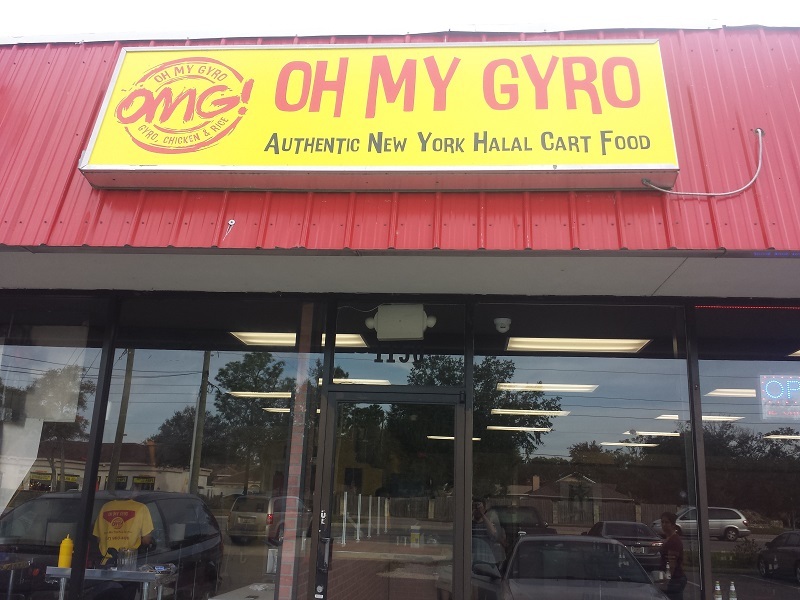 Oh My Gyro touts themselves as having authentic New York Halal cart food. Having frequented halal carts in New York on my visits and comparing the menu here, this seemed to be about right. The menu was simple where you had your choice of platters with gyro, chicken, or falafel or sandwiches with the same fillings. I tried the combo platter. This came with gyro (lamb and beef), shredded chicken, salad, lots of yellow rice, and pita. 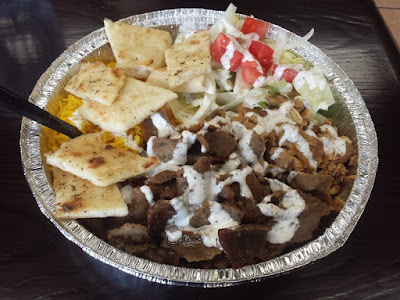 Most everything was topped with the famous halal cart white sauce and hot sauce was served on the side. The portion of food was very generous and tasted comparable to actual New York halal cart food. I enjoyed my food here. As noted with the history of past restaurants not surviving very long in this location, I hope they do well (but try them while you can). 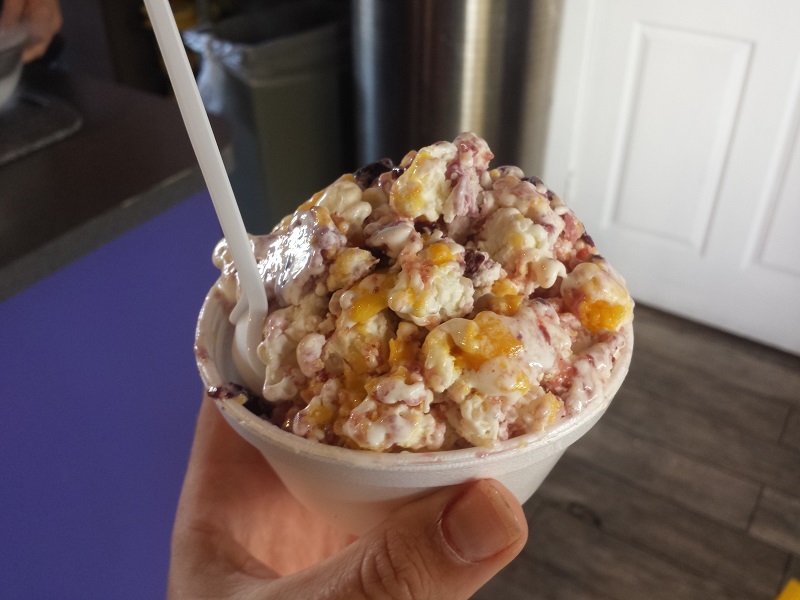 I tried a restaurant called Abracadabra Ice Cream in downtown Kissimmee. 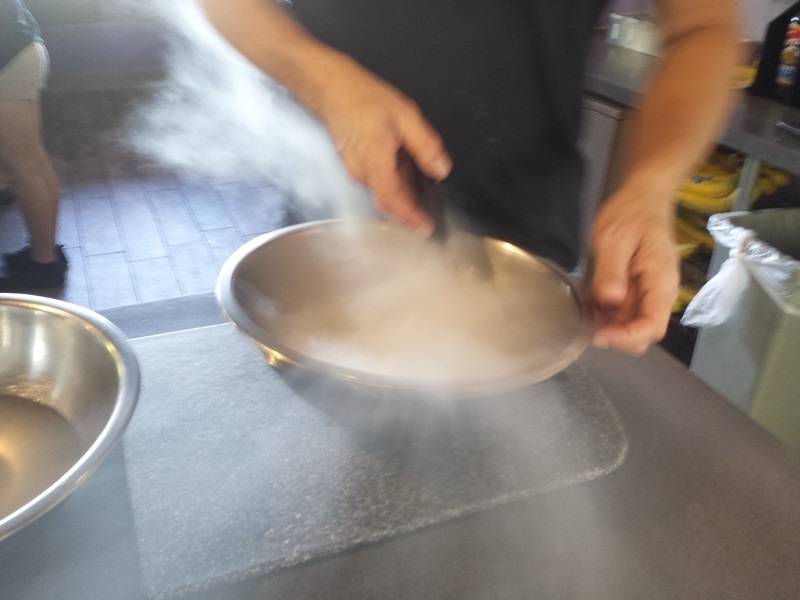 Unlike the standard ice cream shop, Abracadabra served ice cream made with liquid nitrogen. 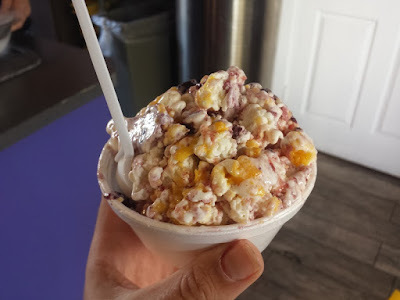 You picked your flavors, they added them in a bowl with some cream, and mixed everything with liquid nitrogen to freeze everything. I choose mango and raspberry as my flavors. The consistency of the ice cream was interesting. It wasn't as smooth as standard ice cream. It sort of reminded me of Dippin' Dots, only with larger pieces of ice cream and a much better taste. I very much enjoyed the novelty of seeing ice cream being formed before my eyes in a misty cloud. I'd return to Abracadabra! 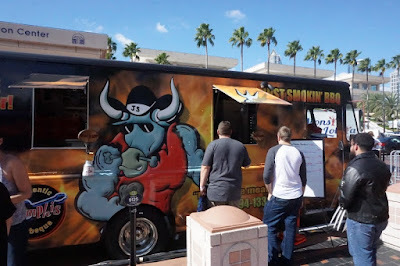 I was over in Downtown Tampa for an event a few weeks ago and found some food trucks parked outside. I decided to have lunch from a truck called Just Smokin' BBQ. Looks like they specialize in Memphis style barbeque. I had the BBQ Nachos. This was pulled pork with nacho cheese, BBQ sauce, and jalapenos served over tortilla chips. They normally do sweet barbecue sauce on the nachos. I saw they had mustard based sauce which I like better, so I had them switch it out. The nachos were pretty tasty overall. 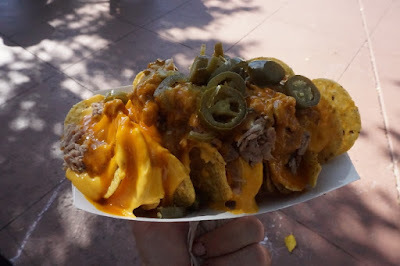 They weren't the most creative version of nachos I've ever had, but they did the trick. I'd probably have this again. 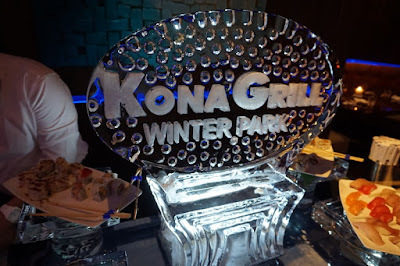 I was invited to the grand opening of Kona Grill in Winter Park last week. 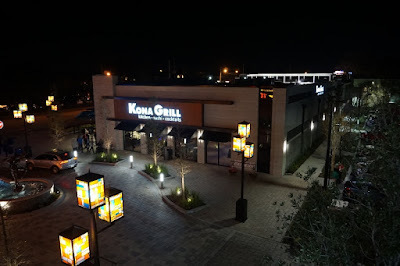 Located in a new shopping center along 17-92, Kona Grill is a welcome addition to Winter Park's collection of restaurants. 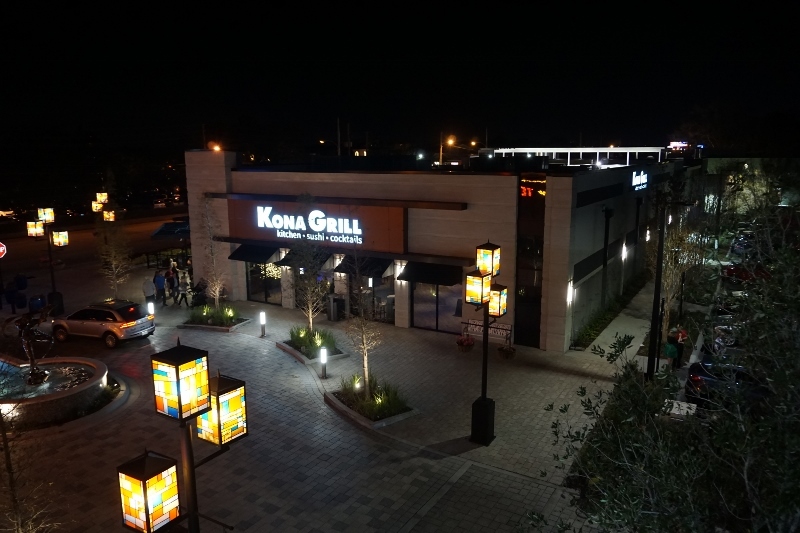 WINTER PARK, Fla. (November 21, 2016) - Winter Park's already outstanding dining scene just got even better with the opening of the new Kona Grill. 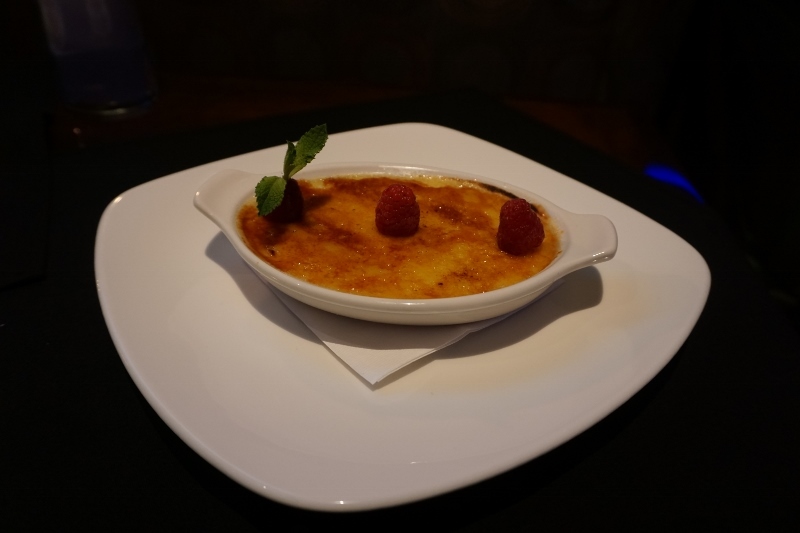 Located in the Lakeside Crossing shopping center, Kona Grill offers a modern American menu, sushi bar and signature drinks - perfect after a day of holiday shopping along Park Avenue. Kona Grill is sure to be a favorite after-work gathering spot, for its happy hour (Monday-Friday from 3 pm-7 pm) and reverse happy hour (Monday-Thursday from 9 pm-11pm and Friday-Saturday from 10 pm-midnight). This is the first Kona Grill in Central Florida, and company's fourth location in Florida. The publicly-traded company (NASDAQ: KONA) operates 44 restaurants in 23 states. A sushi buffet was set up for the grand opening where I was able to sample various types of rolls and sashimi. A large ice sculpture was the centerpiece of the sushi table. 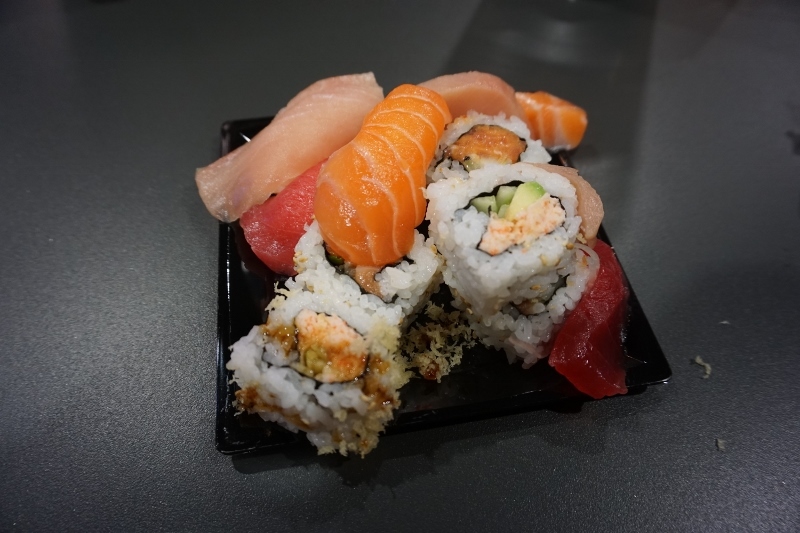 There was tuna, salmon, yellowtail, California rolls, spicy tuna rolls, and more. All tasted fresh and delicious. 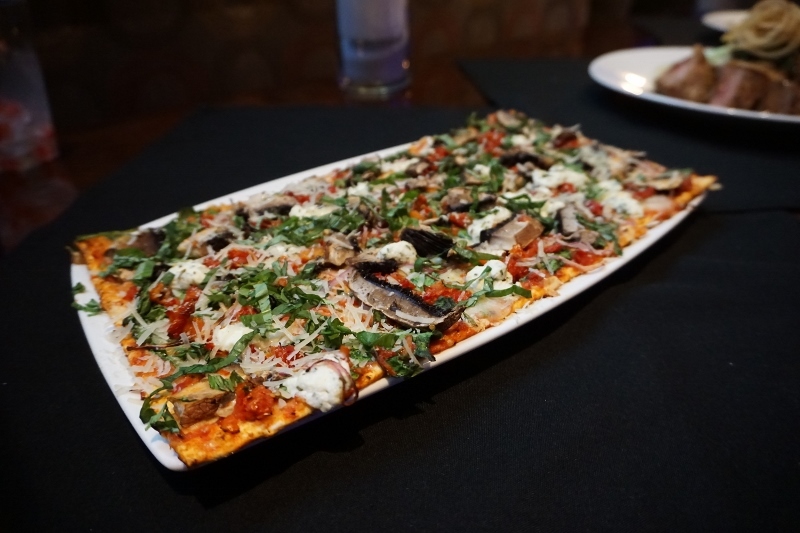 Portobello & Goat Cheese Flatbread - Tomato sauce, parmesan, spinach, mozzarella, sun-dried tomato, red onion, and basil. Big Kahuna Cheeseburger - caramelized onion, cheddar, lettuce, tomato, brioche, homemade pickle spear. Macadamia Nut Chicken - House mashed potatoes, seasonal vegetables, shoyu cream, and pineapple-papaya marmalade. Miso-Sake Sea Bass - Shrimp & pork fried rice and pan-Asian ratatouille. ORLANDO, Fla. (Sept. 28, 2016) - Tin Roof, Orlando's favorite live music joint, has rolled out a new menu featuring a slew of new dishes. Pub BoardsStep one: choose from Tin Roof's new House Smoked Brisket, signature Nashville Hot Chicken, Candy Pig Mac & Cheese (includes brown sugar bacon and jalapeno queso), BBQ Pulled Pork, or Voodoo Shrimp. Step two: choose a couple sides, including new Street Corn, Fried Pickles, Tots, Squash Casserole, Spicy Giardiniera and more. Step three: enjoy the heck out of it all. All Pub Boards are served on - you guessed it - a wooden board. Street TacosPerfect with a cold beer, Tin Roof's new Street Tacos include Carnitas, Chicken Tinga, Pepper Beef (featuring the house smoked brisket), Left Coast (vegetarian, featuring tempura avocado) and Loco Pez (Korean battered grouper). In the mood to share? Try Tin Roof's new Poppers (bacon-wrapped peppadew & pimento cheese croquettes), Chili-Brown Wings or Dixie Biscuits (there's that brisket again, slider-style on biscuits with bacon, peach jam and cheddar cheese). Those who have saved room can finish it off with the new Cast Iron Cookie, a salted caramel-pretzel-chocolate deep dish cookie topped with ice cream. In addition to the new menu items, Tin Roof Orlando is still serving up the best local and regional bands and musicians on the Tin Roof stage. On this visit, I started out by sampling the Chicken N Waffles - Buttermilk fried chicken nuggets, waffle pieces, bacon-maple glaze, and ancho chili chocolate. 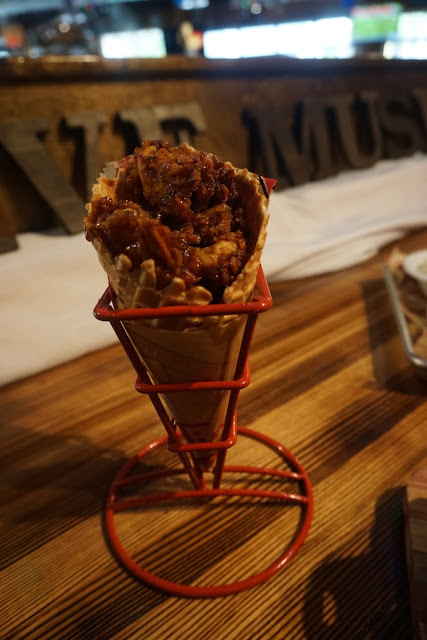 There was a change in the presentation from the last time I tried these, with the Chicken N Waffles now being served in a waffle cone. I liked the continuation of the waffle theme. Candy Pig Mac & Cheese - Elbow pasta, brown sugar bacon, jalepeno queso, aged cheddar, herb bread crumbs, and scallions. Nashville Hot Chicken - Buttermilk fried chicken rubbed with cayenne, served on texas toast with ranch potato salad and fried pickles. This is a continuation of the food from my trip to Nassau, Bahamas. 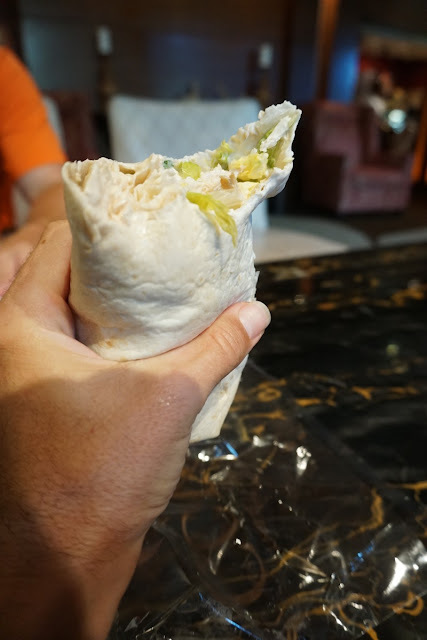 In our recent blog posts, we visited several of the restaurants in Atlantis. Today, we leave the sterilized safety of Paradise Island and head to downtown Nassau. After exploring the city and watching several of the Labor Day parades that I happened to come across, it was time to eat. What to eat in The Bahamas? Why not Filipino food? I found myself at a restaurant called Manila Grill. Manila Grill had apparently been open for less than a month when I was there. The very red dining room was filled with diners and people singing karaoke. The kitchen was in the space next door and opened up to the street where you could see several old women cooking delicious foods. As far as cultural foods go, I am completely lost when it comes to food from the Philippines. I believe this was my first time ever eating at a Filipino restaurant and didn't know what to order. Luckily, the owner was very friendly and basically explained the entire menu to us and gave recommendations. One of these recommendations was Longanisa which was a very garlicy sausage. It was served with fried rice, a fried egg, and pickled vegetables. I ordered a dish where I completely forget what it was called. I should have taken a photo of the menu, but Google tells me it may have been called Sisig. The dish was served on a sizzling plate, consisting of pork, rice, and a raw egg. The plate was delivered and I was instructed to immediately mix everything together to cook and scramble the egg. 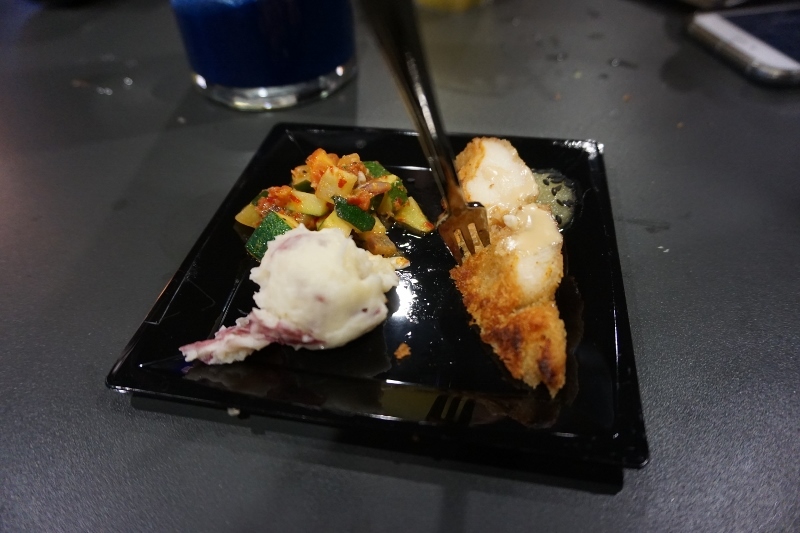 Color-wise, the whole dish looked very drab, but tasted delicious. This is the second post from my trip to the Nassau in The Bahamas. Restaurants were discussed in the last post, but today I'm talking about beverages. The Bahamas seem to get many variations of sodas that we don't get in the US, which are always interesting to try. 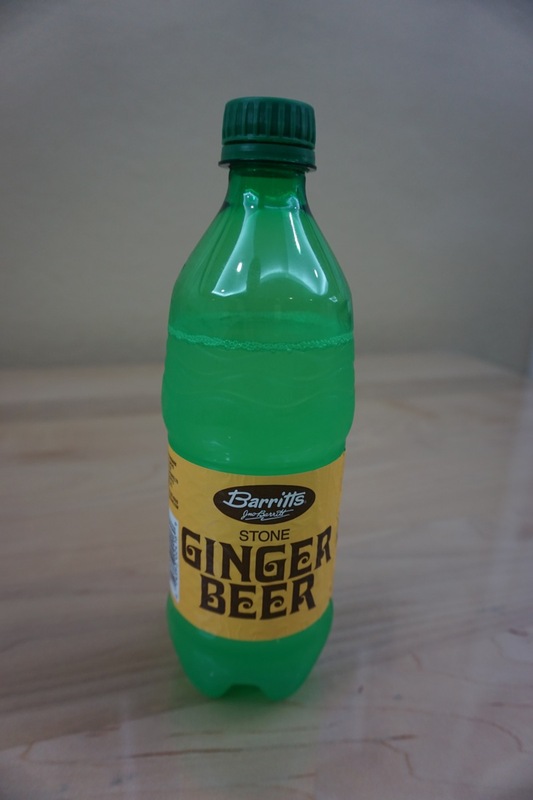 Barritts Ginger Beer was pretty prevalent. All the vending machines and shops seemed to carry this. It was like a ginger ale, only less sweet with a much stronger ginger flavor. I liked it a whole lot. Someone else who tried it found it disgusting. Schweppes Grapefruit Soda was another soda that I was unfamiliar with. 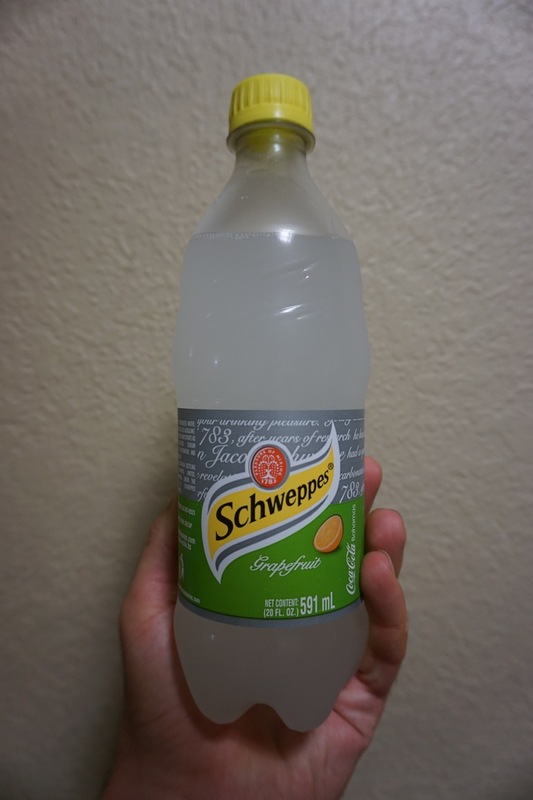 I normally think of Schweppes Ginger Ale, but didn't see any of that being sold in the Bahamas. This was nice, tart, and delicious. I'd take grapefruit soda over orange soda any day. 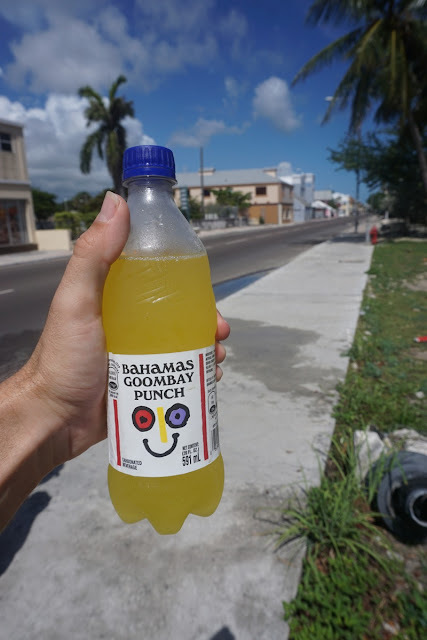 Bahamas Goombay Punch was in all the fountain drink machines in restaurants along with the standard Coke products. It was non-carbonated and tasted sort of like pineapple. My previous bit of traveling was to the UK. A couple weeks later I had the opportunity to head to Nassau in The Bahamas. That's two countries in a row which have Queen Elizabeth II on their money. Most of my time in Nassau was spent on Paradise Island in the vicinity of the Atlantis Resort. 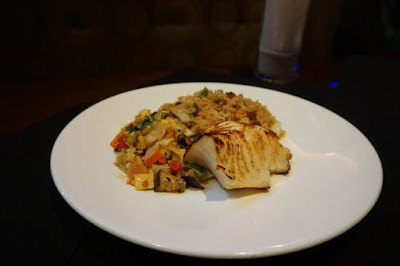 In fact, this particular blog post is all restaurants I ate at in Atlantis. My first meal in Nassau consisted of some of the most authentic Bahamian-Italian pizza one could possibly find in a resort themed to a mythical lost continent. We split an 18" Meat Delight pie. It was topped with smoked bacon, ham, pepperoni, sausage, and oregano. 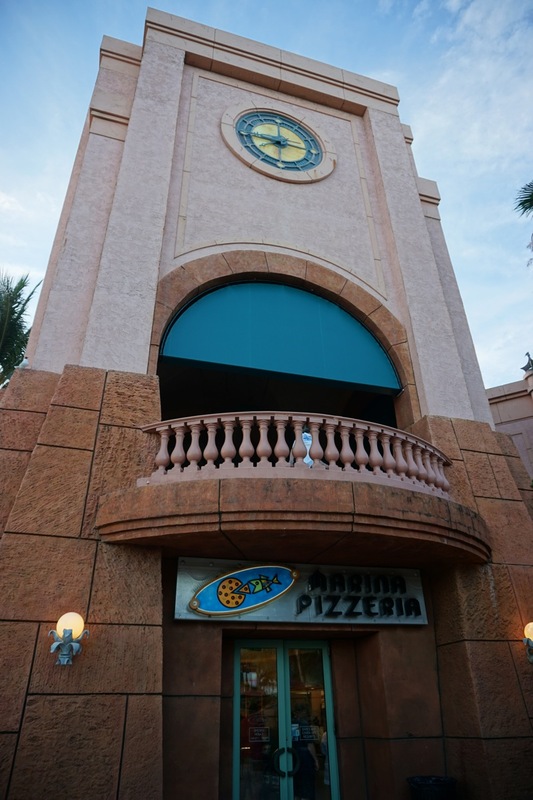 Since it was in Atlantis, this was a very expensive pizza. It ended up being almost $40 for the pie once tax and the automatically included gratuity was added. US dollars and Bahamian dollars have a one to one exchange rate too, so there wasn't some fancy money conversion that made the pizza less expensive than it seemed. Besides price, it was a pretty okay pizza coming out of a hotel. Not the best pizza ever, but perfectly adequate. It was cooked on a conveyor belt oven. There was good proportion of cheese/sauce/toppings. Everything held together nicely, even with the pie being topping heavy. I later found out that restaurants on Paradise Island close early. For an island that is pretty much nothing but tourists, it was a bit surprising that most restaurants either closed at 9 or 10 during the week. Because of this, I returned to Marina Pizza a second time in their last ten minutes of being open because we couldn't find anything else open, on or off property without going downtown. This time I tried a slice of the Bahamian Spice and The Bianco. The Bahamian Spice was topped with sweet peppers, onions, hot banana peppers, and jerk chicken. It was much spicier than I was expecting, which was good! Unfortantely, it did feel like the slice was sitting out way too long with hard, slightly burnt crust. Turned out this slice of pizza was the closest I got to eating actual Bahamian food on my trip. The Bianco was topped with ricotta, mozzarella, and romano cheeses, spinach, and broccoli. This slice tasted fresher, but I preferred the flavors in the Bahamian Spice pizza better. Again, these were expensive at around $7/slice. My second meal in the Bahamas was at one of the most authentic Bahamian-NY Style Kosher delis one could possibly find in a resort themed to a mythical lost continent. I started out with a bowl of matzo ball soup. Mostly because I found the idea of a deli serving matzo balls in the Bahamas kind of funny. Definitely not the regional food you'd expect to eat in Nassau. After the soup, I ordered a sandwich called The Daily Double. This consisted of corned beef, turkey, coleslaw, and Russian dressing on rye bread. Fries were served on the side. Very meaty, but at least the coleslaw added some sort of vegetable to mix it up a bit. Murray's didn't quite get the NY style deli thing just right though. There were many sandwiches that mixed meat with dairy or had bacon on them. Just like the pizza, Murray's Delicatessen was pricey, but I think I've been to some actual delis in New York which were in the same price range, if not more expensive. My third meal in Nassau was some of the most authentic Bahamian-Chinese food one could possibly find in a resort themed to a mythical lost continent. The meal started by splitting an order of Chicken Spring Rolls. I ordered the Singapore Noodles, consisting of rice noodles, shrimp, and chicken in a curry spice mix. I've had similar dishes to this numerous times before, but I think this was the most I have ever paid for a bowl of noodles like this. After the meals I had so far at Atlantis, this was no surprise. The portion size was plenty to eat. Several large shrimp were mixed into the noodles, as well as a generous serving of chicken. I liked the dish. Shrimp Fried Rice was also ordered at the table. The rice was in a similar price range, but the portion size was much smaller than the noodles. Shrimp were also much smaller as well. The person who ordered this ended up stopping at Marina Pizza afterwards since they were still hungry after their expensive fried rice. According to Atlantis' website, Olives is a restaurant developed by Celebrity Chef Todd English. If I didn't just read that there, I would have never known. There was no mention of Todd English on the restaurant's signage or menu which seemed odd. Todd English has a restaurant called Bluezoo in the Dolphin Hotel at Disney and his name seems to always be attached to that restaurant. To us, Olives was the restaurant inside the casino which we were warned about their $200 menu items. When we got in the predicament that Olives was the only thing still open when we wanted dinner, we decided to give it a try. We were given their late-night menu when we arrived, which was surprisingly reasonable. I ordered the fig and prosciutto flatbread for under $20. 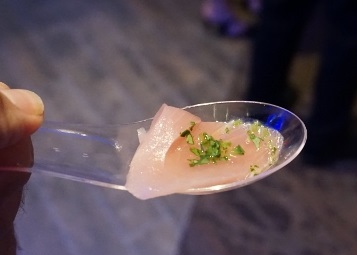 This was my favorite thing I ate on Atlantis property. The flatbread was topped with lots of thinly sliced prosciutto, blue cheese, scallions, and a fig sauce drizzled over the top. Hurry for not costing $200 like we were warned and being my favorite food at Atlantis! Starbucks had the cheapest food that we were able to find in the Atlantis resort. Here's a Chicken Caesar Wrap. Exactly what you would expect from a pre-made wrap at Starbucks. Platos was a fast food restaurant in the hotel serving coffee and sandwiches. Here's a Ruben Sandwich. Unfortunately, the corned beef was super fatty with big streaks of unchewable fat. The bread was good though. I also got a strawberry cheesecake here. Much better than the Ruben. For a fast food sandwich, dessert, and a drink, Platos ended up costing about $30/person.